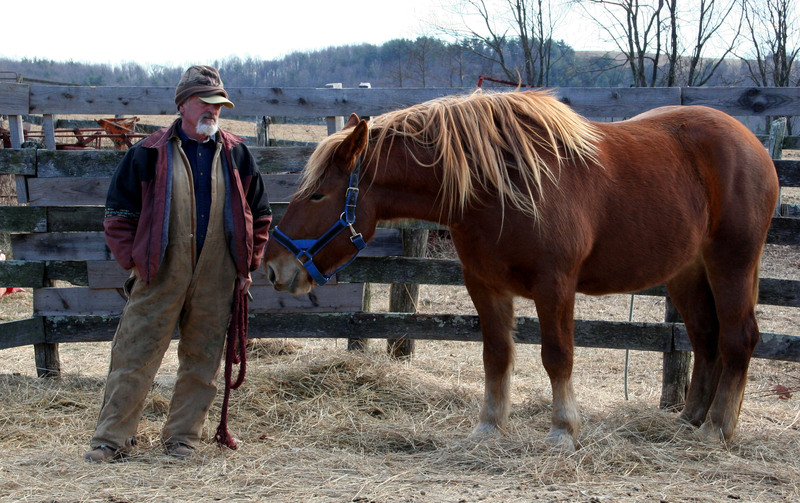 My field of dreams has had a team of Suffolk work horses in it for many years now. Although I’ve had a life-long love of horses and have owned a few saddle horses in my time, the use of workhorses on a small diversified farm grabbed my interest hard about the same time I realized that farming was my calling. 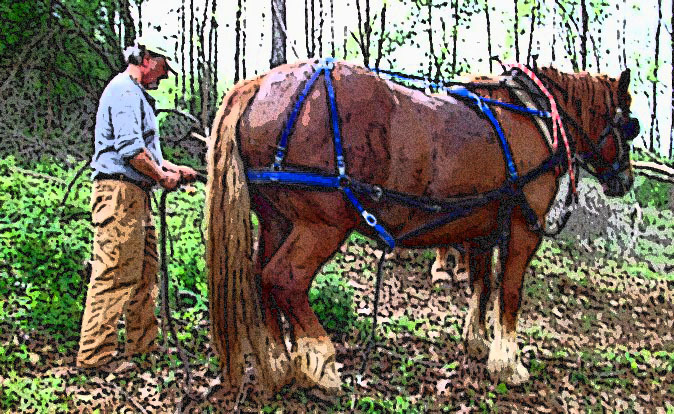 Many if not all of a small holding’s pasture, road and field maintenance as well as woodland work can be done with actual horse power; in most cases better (and quieter) than a tractor, with far less negative impact on the land. Horses also contribute nutrients with their manure, and lawn-mowing can be a side benefit if you are so inclined to set up moveable paddocks where you want grass nipped short. Yes, they are slow. If you have 50 acres to plow, mow or till, you can get it done with horses but you’ll need more than two and lots of good weather. 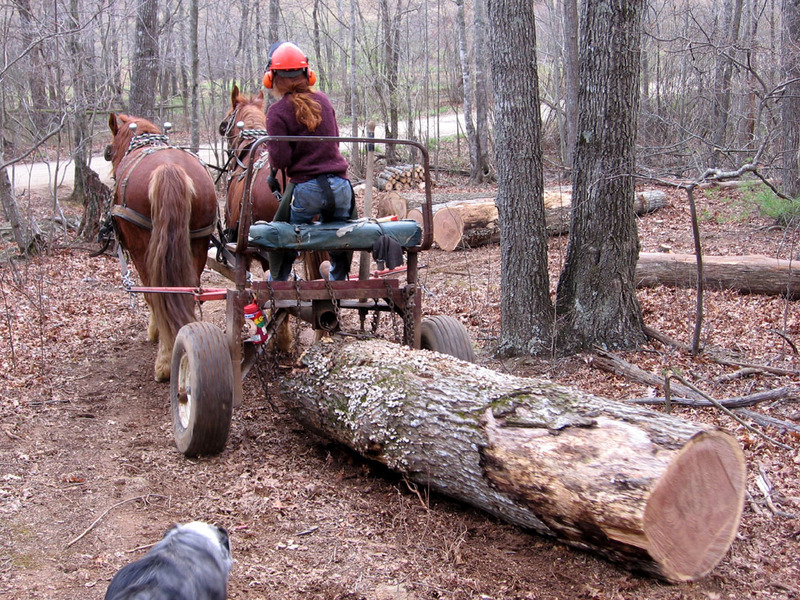 And yes, it is a lot of work to care for, train, harness, and actually use a team of horses to perform useful tasks. Yes, they do get sick or hurt and need veterinary care. But on the flip side, tractors break down, guzzle endless gallons of diesel fuel, oil and lubricants, and their weight compacts the soil. Furthermore, as my dear friend Jason Rutledge has noted on many occasions, you will never find a baby tractor waiting for you in the barn one morning. 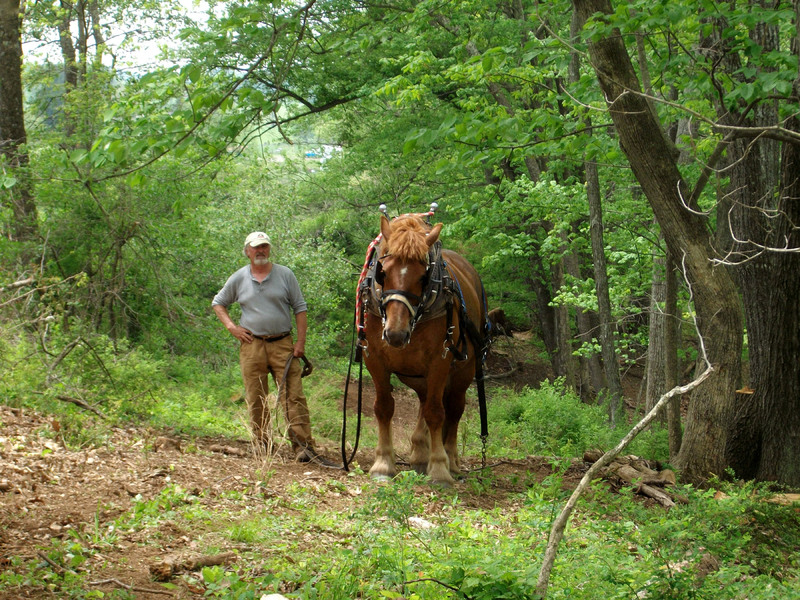 Horses reproduce themselves, which is a long-term proposition for the teamster, but then so is everything else about running an ecologically sound small farm. I can’t really say how I became enamored of the Suffolk Punch breed. I did a lot of reading and research, and liked what I learned about their temperament and suitability for farm work. The Suffolk was developed specifically for farm work in 16th century England and became quite popular by the mid 20th century, just before the mechanization of farms brought about the decline in common use of horses for agricultural power. Short and powerful, with a good temperament and work ethic, the Suffolk. Not as many of them around as, say, Belgians or Percherons. A well-trained team of Suffolks is hard to find. I found a mother-daughter pair several years ago, and set about having them trained and worked during the last few years of my military service, aiming to have a reasonably-experienced team ready to join me on the farm after my retirement in late 2011. Those mares didn’t work out, to make a long story short. So I’ve been waiting, and looking, and biding my time, getting the cow herd started and the farm operation up and running. Getting my first year under my belt. A little while ago, as Winter passed into Spring, something told me it was time. Time to get ready for work horses. Didn’t have any good prospects, wasn’t really eyeballing a particular team for sale, but the need to prepare was very strong. I’d finally decided on a good stock trailer and purchased that. Then, when my oldest sister said she’d like to come out in between season jobs and help with whatever project I had going at the time, I thought, let’s build a pole barn. For the Suffolk horses. That I hadn’t found yet. But I did soon after. 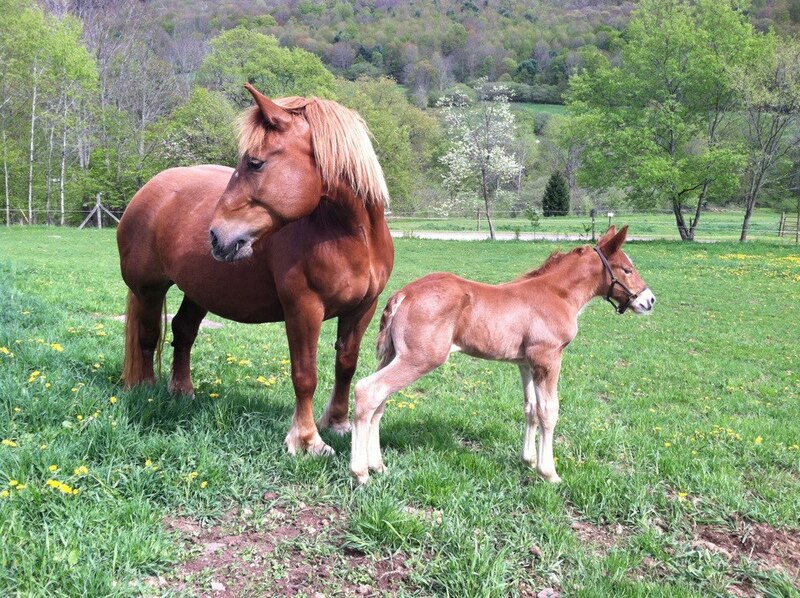 Not a trained team, but a brood mare with colt foal at side and her yearling colt from last spring, from a breeder up in New York that is dispersing their herd. With any luck she’ll be re-bred before I go pick them up; another generation on its way. Not sure and not expecting how the youngsters will turn out. There’ll be a future team of workhorses in the mix one way or the other. Time for all that to happen and unfold. 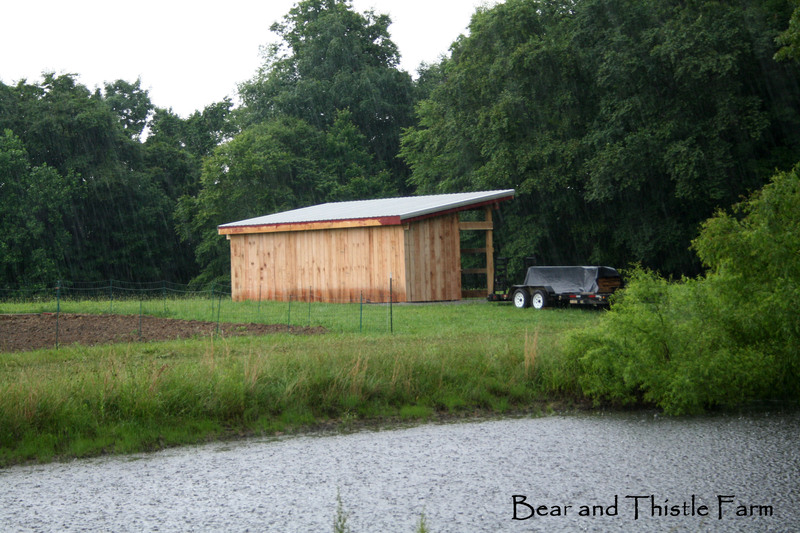 But the barn idea started the ball rolling, and the barn is well on its way to being built, and in a few short weeks I’ll be headed up north to load and trailer some very nice Suffolk horses back to Bear and Thistle Farm. Because I decided to build their barn. It takes a lot of time, effort and patience to train two big, beautiful, spoiled hay-eating machines to be actual workhorses. There is nothing in either of my mares’ life experiences that prepared them for life on a working farm, being around other horses, noises and distractions, or doing anything other than lounging together in a big pasture and having grain and hay brought to them in abundance without any exchange of effort for it. The transformation is being accomplished slowly, sometimes in small steps, sometimes in leaps and bounds – but it is happening. 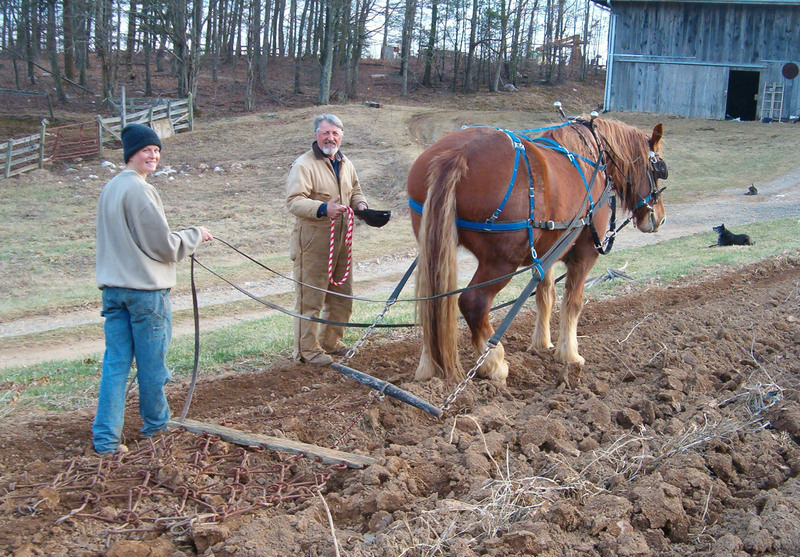 This picture of 8-year-old Justice in harness, dragging fresh-plowed garden soil with a smiling Mel on the lines and Jason grinning as he removes the lead for the horse to take her first working steps, shows the progress they’re making and how pleased they are with it. It choked me up a little when I first saw it, seeing the joy on their faces as they turned to show me through the camera how far they’ve come with the project of making these fine mares into workhorses for Mel and Adam to use. I can see that horse’s mind working, too, which is the part of all this that I am the most in awe of. This big, young mare has never done anything like this in her life – suited up in harness, responding to signals on the reins and bit and commands from the two-legged alpha, doing what she’s asked to do – this is as alien to her as walking upright would be, yet at the same time, it isn’t strange at all, and you can see her becoming, right before our eyes, a workhorse. Two months ago she was skittery and lacking manners and herd-bound to her daughter; now she is much less all that, much closer to the skilled, experienced workhorse she will be in the years to come. And it is happening because she’s figuring it out, and has good coaches, people who know her potential and know what is required to get her there. There’s still much to be done and a long way to go. Jason wrote yesterday that he’d bought a new sulky plow and is planning to hitch the girls between the two geldings they are pastured next to and have grown accustomed to, so they can learn to work by their example, alongside horses that know to move when asked and stop when told and stay still in between. That should be a mind-opening experience for both of them. We arrived at the girls’ new home in southwest Virginia around 3 pm – a little later than planned for, as the 7+ hour drive from Kentucky turned into more like 8 with a few wrong turns and all the winding roads to navigate through. We’ll surely plot a more straightforward route for next trip, but it was scenic and took us through some beautiful country we’d never seen before. After hello’s and introductions, Jason took us straight out to the barn where J and L were waiting in box stalls, getting brushed by Melanie. She led them out one at a time, to stand there in the corridor near the open door, for me to have a look. Oh, what horses these are. Tall and thick, with legs like oak trees and densely muscled haunches and shoulders – they’ll be pullers for sure, once trained and used to it. For now they are very good at one thing: eating hay, and have not learned to stand still, and are maddeningly attached to each other, as you would expect a pair of horses kept together and not worked to be. I had asked if we could see them move in the round pen, and the late afternoon was not too cold, so we took them up there one at a time, to see their response to Jason’s gentle requests, loose in the corral with him. They started out distracted, but moved out well when asked, and connected with him in just a few minutes – a good first lesson, I think. We led them back down to the pasture in front of the house, and went in to the warmth for a wonderful evening of conversation, endless stories, and delicious home-cooked food. I was sorry we only had the one afternoon to spend there. But it was good to meet everyone, and see the horses, and know they are in good hands.